Our Amaretto Semifreddo has crunchy almonds layered between luscious whipped cream and crumbled biscuits. This twist on a classic takes just 15 minutes to prep. WHISK in a large bowl the cream, condensed milk and vanilla extract until it forms soft peaks. Do not over beat. FOLD into the cream mixture 2 tbsp of the amaretto liquor and the chopped almonds. CRUSH the amaretti biscuits and drizzle with 2 tbsp amaretto liqueur. PREPARE a loaf tin lined with cling film leaving it hang over the sides. SPRINKLE half of the amaretti biscuits into the base of the loaf tin then gently pour half of the cream mixture on top. THEN another layer of the remaining amaretti biscuits finishing with remaining cream mixture FOLD over the cling film and place in the freezer for 5 hours or until frozen through. TO SERVE melt the dark chocolate and set to one side. 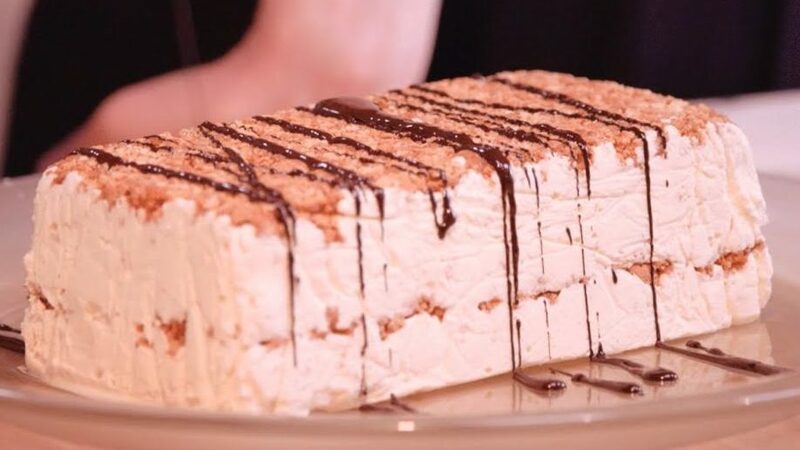 Using the cling film to help you turn the semifreddo upside down onto a platter. DRIZZLE the cooled melted chocolate on top of semifreddo and return to freezer for a further 5 mins to set.